Without a doubt, milkshakes are a sweet staple in restaurants across America. I wanted to see what Thurston County had to offer in regards to flavor options and cost. I visited five locally owned and operated venues offering milkshakes, ranging from sit-down options to drive-thrus. In order to make an equal and fair comparison, I ordered a plain chocolate shake in the smallest size offered. First up is an Olympia staple, Eastside Big Tom’s. Big Tom’s is a drive-thru that’s well known for their Big Tom burger and crinkle cut fries. The service was very fast and friendly, and I hardly had to wait for my shake at all! Big Tom’s is unique because they offer a drive-in experience with the option to sit down as well. There are both covered and uncovered outdoor seating options. Another fun and defining aspect of Big Tom’s milkshakes is that they feature a Shake of the Month in a variety of interesting flavors, such as Lucky Charms and Cap’n Crunch. A small shake (16 oz) at Big Tom’s costs $3.99 and a large is $5.24, which is right in the midrange of the five locations I visited. 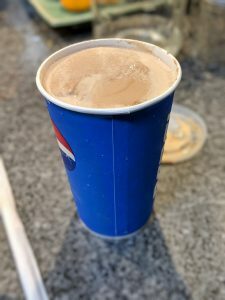 They offer 17 shake flavors, ranging from classics (like chocolate or strawberry) to a few more interesting ones, such as pineapple or Dr. Pepper. However, you can always mix and match flavors to create combinations like peanut butter chocolate. 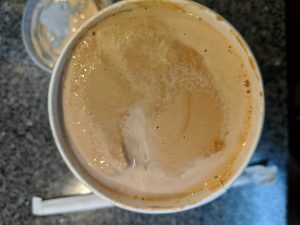 Another Olympia foodie favorite is Eagan’s Drive-In, which is famous for their burgers, but has the most impressive milkshake flavor list I’ve ever seen. I ordered a chocolate shake, but it was hard to not try one of Eagan’s harder-to-come-by flavors, such as salted caramel or huckleberry. The employees at the drive-thru were very friendly and I received my milkshake quickly. Eagan’s also has another location in Tumwater where you have the option to sit down. 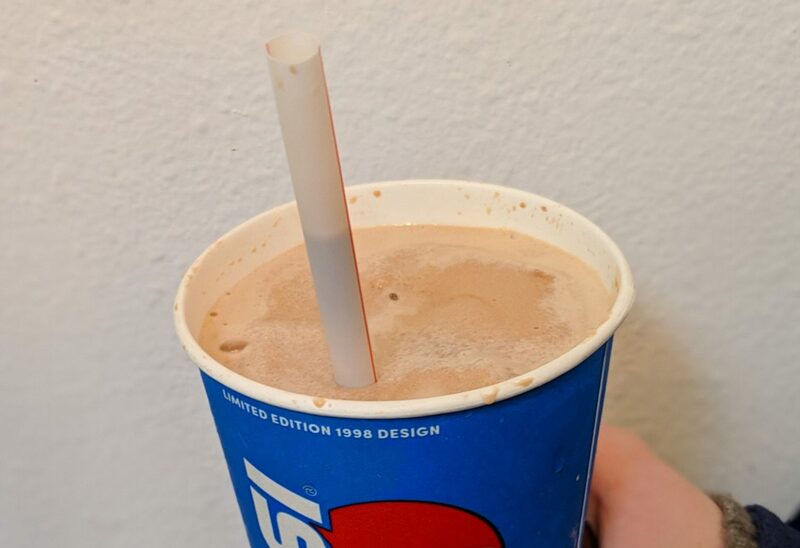 A small chocolate shake is $4.95 and a large is $5.65. This is definitely more expensive at practically $6 for a 16 oz shake. However, all of the interesting flavors are the same price, so depending on what type of milkshake you are planning on ordering, $6-7 may be worth it for the ability to choose from the 45 listed flavors. King Solomon’s Reef, located in downtown Olympia, is a traditional-style diner offering a range of food choices. It’s a great place to sit down to have an old-fashioned milkshake. A big draw to visiting King Solomon’s was the classic milkshake experience. The diner serves shakes in a glass with whipped cream and the extra on the side in the familiar metal cup. The whole experience is evocative of a malt shop because you can see the employees making your drink by hand with hard ice cream. A milkshake at King Solomon’s Reef costs $4.99, which is on the higher end of the shakes I tried, but they are definitely the best value for the volume. It should be noted that there is only one rather large size option at King Solomon’s. That being said, two people could easily share a King Solomon’s milkshake for less than $6, which is pretty affordable. Before researching milkshakes in Thurston County, I had never heard of the Lacey drive-thru Canna Cabana Subs and Shakes. However, they were so delicious and unique that I now plan to go back to try one of their numerous sub sandwiches. Canna Cabana is a unique experience because it’s a drive-thru setup reminiscent of a coffee shop, however it serves a wide variety of sub sandwiches and non-traditional treats (like no bake cookies). I found the employees to be very polite and helpful, even while dealing with a high volume of customers late in the evening. At the Marvin Road eatery, milkshakes range from $4.25-$5, depending on the flavor. Visitors can upgrade from a 16 oz cup to a large for $1.50 more. The menu also features the venue’s special House Shake, ($5) which contains chocolate, peanut butter, Oreo, and caramel. Norma’s Burger Hut was another new stop for me on this milkshake research project. Located on Martin Way in Lacey, this intimate building features a giant hamburger on the roof, making it easy to see while driving along the busy road. While it’s a smaller restaurant, there is seating inside and a friendly, helpful atmosphere. Something I really appreciated about Norma’s is that they had the widest variety of sizes, as well as the cheapest prices. They were the only restaurant I visited with a 12 oz option, which makes it ideal for families with kids or for a quick bite. At Norma’s, a small (12 oz) milkshake is $2.75, a medium (16 oz) is $3.75, and a large (20 oz) is $4.75. In addition, instead of featuring a military discount, Norma’s has a 5% discount for a customer paying with cash, which definitely makes it budget friendly. Norma’s features an impressive 34 item flavor list as well. All in all, Thurston County has a wide variety of options when it comes to milkshakes. Some eateries offer a shareable size, some boast a huge number of flavor choices, and others are most family friendly in their size and pricing options. All choices offer great milkshakes for every taste and budget. Sweet!